FitnessSyncer Dashboard is a display of your data as reports with graphs which allow you to see your health and fitness over time. Quickly spot trends or anomalies in your exercise routines and stay motivated. Users on our free tier can only see the most recent 30-days worth of data and cannot customize the dashboard. By default, we show the data in a weekly granularity. You can change this by selecting the graph by icon () and you may choose between day, week, or month. If you are a FitnessSyncer Pro user, you will have the option to show all of your data using presets () or be able to customize the date range () to zoom into the precise data you are interested in, such as filtering into a specific sport or activity (). 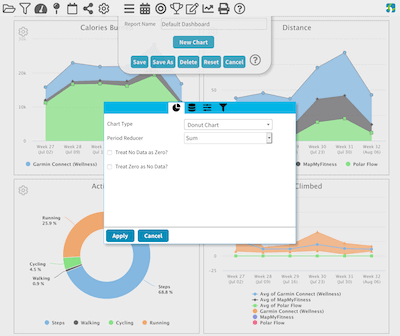 FitnessSyncer Pro users can also customize and save an unlimited number of Dashboards with a bunch of data visualizations to help you get the most of your data. Reorder the charts by simply clicking and dragging charts to the location you wish. Remove charts by clicking the Gear () near a chart and selecting the Remove option. Change the width of certain charts by clicking the Gear () near a chart and selecting the Toggle Width option. Note that if you do not have information for a given chart, FitnessSyncer will not display the data associated with that component. For example, if you add a Blood Glucose chart, but do not have any sources with Blood Glucose information, the chart will not be shown. To open a previously saved chart, click the folder () icon and select the dashboard in question. You can replace the Default Dashboard simply by saving one of your dashboards with the “Default Dashboard” name. To restore the default dashboard, simply delete this dashboard and the default components will automatically repopulate. For mobile users with a Pro account, you can create a default mobile dashboard for your mobile device. To do so, save your mobile dashboard with the name “Mobile Dashboard”. We store your filters, scope, and graph by settings as part of your report and will reload that when you refresh. Because of mobile apps use global preferences for these features, these are not used within our mobile apps. Key Performance Indicators (KPI) are numeric summaries of your data. Depending on the type of data, you will have the option of Minimum, Maximum, Average, and Total. Note that the math is done on the summarized data for the time periods you have selected; for example, if you are looking at weekly data, the Minimum Key Performance Indicator would show the number that is the minimum week. What is the easiest way to export a table to a CSV? If you enter into Report Editor Mode, click on the Gear hear the table you wish to export and if the data is available, there will be a link named Download as CSV to access this data.